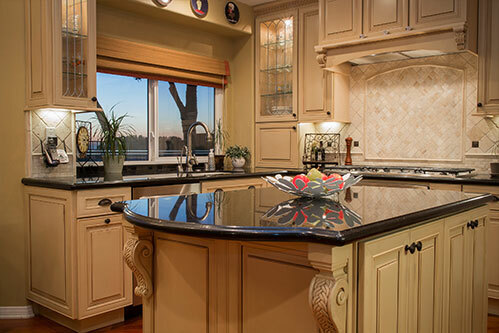 Making this smaller space function is paramount by using an island to accent the overall custom cabinetry. Using black Cambria for the counter tops along with black/bronze colored hardware gives this kitchen a unique impression. Using clear glass “leaded” style cupboard doors provides more of an airy feeling. Notice the special under counter and in cupboard lighting. Not seen of course are the oven which is under the stove and other stainless steel appliances.